What is Reality Sports Online? Reality Sports Online (“RSO”) is engaged in the development and dissemination of reality-based fantasy sports products. RSO aims to provide fantasy users with a realistic and engaging online general manager experience by simulating the front office operations of a professional sports franchise through its sophisticated platform. RSO’s leadership is comprised of former NFL team personnel with experience in football operations, football administration, and legal administration. RSO was named the 2012 Rookie of the Year by the Fantasy Sports Trade Association (“FSTA”) and was a finalist for the Most Innovative Product award. In 2013, RSO’s GM of the Year Contest was a finalist for the FSTA Most Innovative Contest Award. Reality Sports Online launched its first product, a Fantasy Football Front Office League Manager/Commissioner Platform (the “Football Platform”), in July 2012. The Football Platform allows real participants to build and manage their fantasy teams like an NFL general manager and compete against one another during the NFL season. The Football Platform’s most innovative feature is its Free Agency Auction Room, in which up to 32 fantasy owners compete against each other to sign NFL players to single and/or multi-year contracts. 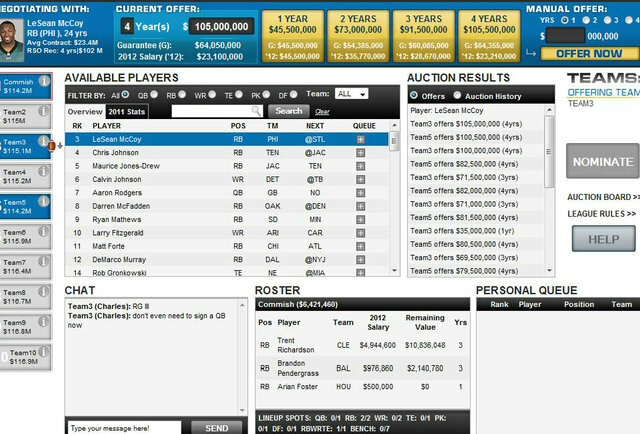 The Free Agency Auction Room simulates NFL Free Agency over the course of 3-4 hours, instead of 3-4 months. Additional features of our Football Platform include a Rookie Draft (with slotted contracts), the NFL salary cap, guaranteed money, salary cap acceleration, in-season signings, injured reserve, a franchise tag, a full range of customizable settings and scoring categories, and much more. Our company’s mission is to pioneer, and become synonymous with, a new category of fantasy sports by developing realistic front office platforms across multiple professional sports, which provide customers with an unparalleled user experience. In early 2012, Reality Sports Online’s President/CEO, Matt Papson, and COO/GC, Stephen Wendell, worked together for an NFL team. The duo set out with a vision to build a better fantasy football platform, based on the idea that fantasy sports, at its core, is about creating and simulating the experience of a professional sports general manager and front office. The company enlisted the help of Big Game Software to turn “Fantasy into Reality” through the use of innovative technology. In late 2014, RSO welcomed CTO, Kyle English, to its team to serve as its lead software engineer. Besides being a killer programmer, Kyle has been an active fantasy user for a long time. In addition to its core team, RSO also enlists several other personnel with NFL experience to provide content for the site. Big Game Software (“BGS”) provides software development and website management for Reality Sports. BGS is a software development provider, specializing in fantasy sports. BGS’ team has an in-depth knowledge of fantasy sports applications, having developed products ranging from analysis tools to contests to content & networking portals for several of the leading companies in the fantasy sports industry. BGS’ applications have helped power sites and provide users with games and content for a wide variety of sports, including professional football, baseball, basketball and college March Madness. The Rookie Scouting Portfolio (“RSP”) is the most comprehensive publication of NFL prospect analysis at the skill positions. Devised from best-practice methodologies, the RSP provides rankings and analysis and also shows ‘its math.’ RSP makes the evaluation process as transparent as possible to the reader, as everything documented with play-by-play detail and every player is graded by position. Dynasty League Football (“DLF”) is the industry leading source for dynasty, keeper, devy dynasty and IDP fantasy football information, strategy and conversation. DLF believes a dynasty league is the most challenging and rewarding fantasy football format, and the goal of the DLF team is to give fantasy users the tools and knowledge they need to dominate their leagues. If you would like to connect with some of the brightest fantasy football minds around, visit their forum and become a part of one of the best fantasy football community on the web. Dynasty Nerds was founded by a couple of guys who have been studying and playing dynasty fantasy football passionately for over 10 years. Their goal is to provide you with all of the dynasty fantasy football information you need. Whether it is our weekly podcast, up to date rankings or great articles, Dynasty Nerds is there to help you build a team that will sustain success. When it comes to dynasty, we all need as much information and insight as possible to build a winner, and that’s what they try to give you. 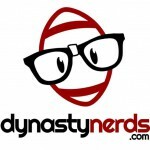 They have an experienced staff that is willing to go the extra mile, so never hesitate to use their forum or reach out to them on twitter @DynastyNerds for help. Pro Football Focus provides our player projections. The goal of Pro Football Focus (“PFF”) is to provide the most in-depth, accurate and thought-provoking information on professional football player performance available on the web. Each week the PFF team spends hours analyzing games to provide users with information they simply can’t get anywhere else. Whether it’s “need to know” or “nice to know”, PFF tries to measure it.